As part of our currently offered performance enhancements for vehicles from Porsche, we have also equipped the 718 with a Stage 2 upgrade. The 4-cylinder turbo-boxer engine with 2.5 L capacity is supplied with a stock power of 350 hp and 430 Nm of torque, in factory state. 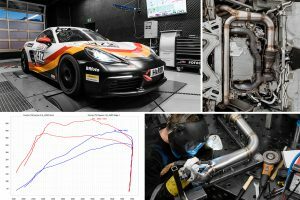 With our software upgrade and the brand new in-house stainless steel downpipe with 200 cpi Kat, from our label mcpipes, the Cayman now comes to a performance of 450 hp and 530 Nm of torque. That’s a performance increase of over 100 hp and 100 Nm of torque.